Eeks!!! I don't officially start as a Bella babe until tomorrow (December 1st) but I couldn't resist playing along with this fantastic sketch for this week's challenge. If you're a regular to my blog, you know that I'm a sucker for a sketch. LOL! I thought about switching it up and flipping the sketch but I love it just the way it is. I fell in love with this DP from Pebbles a few weeks ago at my LSS and knew I HAD to have it. Yup, I'm a sucker for pretty paper. It makes me warm and giddy. LOL!!. 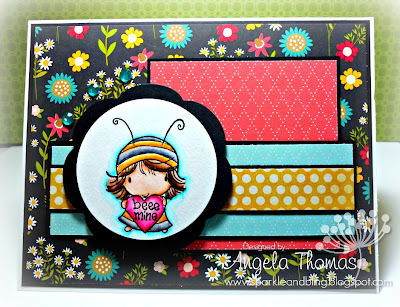 For my card, I've used the image called "BeeeMine Huggabugg". The image has been watercolored with Tombow Markers (surprising, right??). Next week's challenge is to create a TAG!!! You can always back your tag onto a card. It's a perfect time to be making tags with Christmas coming soon. Guess what! Stamping Bella is now hosting Bellatastic Tuesday challenges their Splitcoast Stampers Forum and we are debuting the very first one! Want a chance to win $25 in Bella Cash to go on a spending spring in the Stamping Bella Store?! Then play along with us! It's an "Anything Goes" challenge this week and the only requirements are that you use any Stamping Bella image and then upload your creation to your Splitcoast Stampers gallery and use the keyword BELLANOV2012! The challenge will run from today until midnight EST on Monday 10th December 2012. During this time, participants cards will also be posted in a special blog post over on Bloggabella! You may very well also see your cards on our Pinterest board! The winner of the $25 prize will be chosen at random from the entries, and will be announced here and over on Bloggabella on Tuesday 11th December. Good luck! and hope to see you there! Oh Angela, this is stinkin cute! 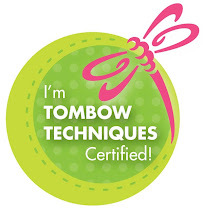 I love the papers too (I am a huge floral fan) and the bright colors you get with your tombows. Love this card Angelabella! A big congratulations Angela Bella. I just love the colors on this sweet card. Fantastic! The colours just pop out at you and this is a super bright, cheery card! What a fun card - I love Pebbles too. Congrats on the new gig. Love the bright and cheery colours Angela. I'm a sucker for pretty papers too. Fantastic job on this weeks challenge. Really stinkin' cute!! Fabulous coloring as always and congrats! Ok now I need that paper!! Angela this is so stinking cute! !